Untangling My Chopsticks , by Victoria Abbott Riccardi, Broadway Books, 2003, 282pp. A young woman goes to Japan and studies kaiseki cooking for a year. I think Susan gave this to Patricia, but I grabbed it immediately. This is a pleasant book, earnest and readable. Victoria is not happy with her advertising job in New York, so she goes to Japan to find something different, and does. God knows, I can relate to that. 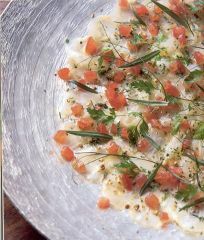 It is also a great idea to include a few recipes in the book. I have not cooked any. Some are real basics, like oyako domburi, and some are more like jokes (Christmas Cake). But it did remind me that is fun to make a nest of noodles in your soup bowls, which I did shortly after reading the book, placing a few quail eggs inside as well. There are a few pointers that I did not know, like when eating sushi, it is an insult to the chef to add wasabi to the soy sauce, since the fish should already be seasoned perfectly. But I cannot really trust any details, since Victoria's research is superficial. She blithely states that tempura is named after the temple grounds where it was sold. 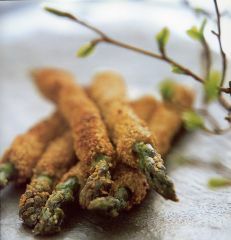 I had heard it derived from tempora -- the festival times when Portuguese could not eat red meat. And some etymological dictionaries say it comes from Portuguese tempero - "seasoning". All three are discussed on this Kikkoman site, which adds the fact that earliest documents show tempura as a paste of thrush meat, shrimp and ground walnuts! Vicky could have dug deeper. Similarly she describes only a couple of Kaiseki meals, and while the symbolism is fascinating (mitsuba means "come back again"), I feel there is a lot more to be told. In fact, I wanted to hear it from Stephen. Stephen is a plump gay guy who lives in Kyoto, even thirteen years later when Victoria goes back for a visit. He is the one who translates for her in her cooking class, and he is the one who plans, organises and largely cooks and explains the kaiseki meals that Victoria helps with. I bet he has a more complex story to tell. I couldn't google anything about him, and suppose his is one of the names that Victoria changed for privacy. Victoria makes good friends with her host family, learns a bit about Japan and goes back to New York feeling transformed. She then marries her old boyfriend, becomes a food writer, and lives happily ever after. Ms Riccardi remarks that the only other significant book on kaiseki in English is Kaichi Tsuji's Kaiseki . I bought this book, which has a foreword by Yasunari Kawabata the Nobel-prizewinner, back when I lived in Japan and could barely afford it, due to the beauty of its plates, particularly number 96. I reproduce some here. Many of the bowls are borrowed from museums. 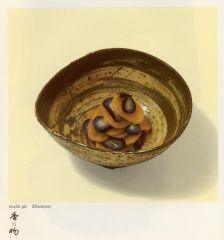 Plate3 - Tai on Oribe "pine bark flake" shaped dish, Momoyama period, Motoyashiki kiln, Mino area. 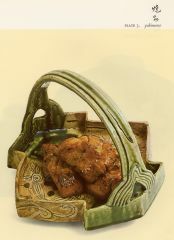 Plate 58 - lily blossom bowl by Ninsei (mid 17th) with prawns, nori, matsubana. Plate 96 - brushmarked bowl, korea, Yi dynasty (hmm, anywhere in 518 years ). Takuan & eggplant. 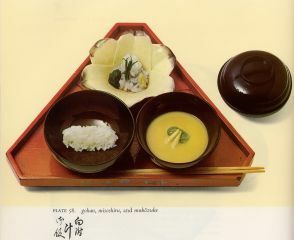 More recently, I bought Shunju , also for its very beautiful food pictures. John wrote: She's been a judge at least twice now on Iron Chef America. I replied: What did you think of her on TV? I wish we got Iron Chef here -- it's funny (the Japanese one). I see our rental shop doesn't have it either. Doug wrote: Erich, have you read Angry White Pyjamas ? It's about an American in Tokyo who goes through the Tokyo Police Academy's Aikido training. I loved it.